“Amateurs sit and wait for inspiration, the rest of us just get up and go to work,” wrote Stephen King. And every time you achieve something, you get a sensation of satisfaction. This satisfaction is productivity that has come to life, fulfilled it's goal. In Weekdone, we believe in high standards and hard goals. One of our ambitious goals is to help and show the best methods, ways, tips and hacks in order to GET WORK DONE. 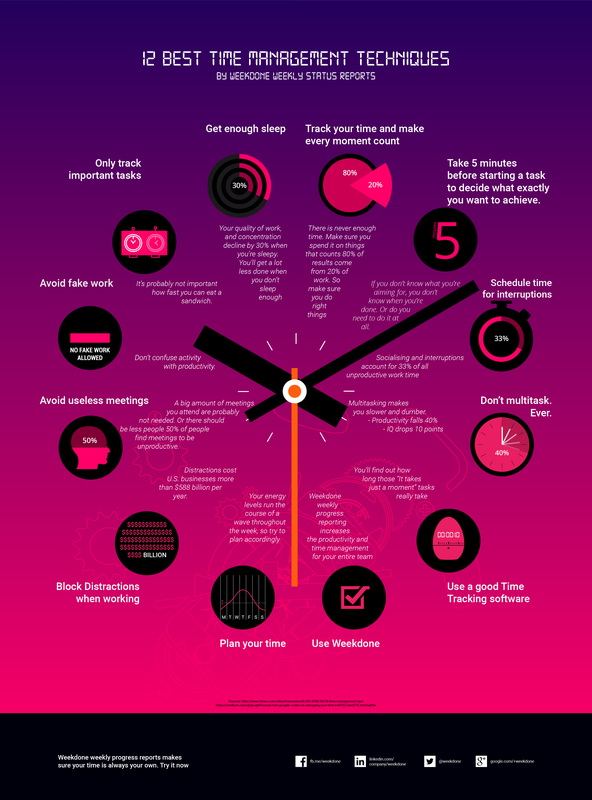 That's why we have gathered the best 10 infographics that we believe to be simple, practical and proven to make you more productive. When working, we want to get the maximum results. For that we need a lot of productivity. If you can finish one extra task every day, you'll do 365 extra tasks every year and that's a lot of extra satisfaction. Time management is one of the biggest struggles in our day-to-day lives. How to balance work and personal life? How to make sure things get done? How to stay happy while doing so? A happy team is also a productive team. So, when team-members don't work well together, your alarm should go off. It's a pretty loud signal that soon the team performance and productivity might suffer as well. And we all know who will be hold responsible for that. You are doing your best to get your work done, but something keeps holding you back. It's like a flu that inhibits your every effort to perform. Leaving you overwhelmed, stressed and generally sad. „If you're walking down the right path and you're willing to keep walking, eventually you'll make progress,“ President Obama has said. This is, I think, a profound statement about Presidency. It means that if you keep pushing, keep trying and know that you are right, success will come. Remember to follow us on Twitter, Google+ and Facebook for all about productivity, productive, efficiency and more!